As Meredith and I were getting ready to start walking back from the Jefferson Memorial, we saw what looked like a small flock of lambs in the distance. Turns out it was a group of no less than eight white terriers, all leashed up and meandering around their owner. It’s a wonder that he was able to avoid being totally entangled. Of course we had to stop by and say hello! These dogs looked so happy with their tongues out… but then again, maybe that’s just us projecting our emotions on them? They could have been miserable for all I know; it was pretty hot, they all had shaggy fur coats, and weren’t even able to sweat. They definitely seemed to be enjoying all the attention though, which was certainly not in short supply. 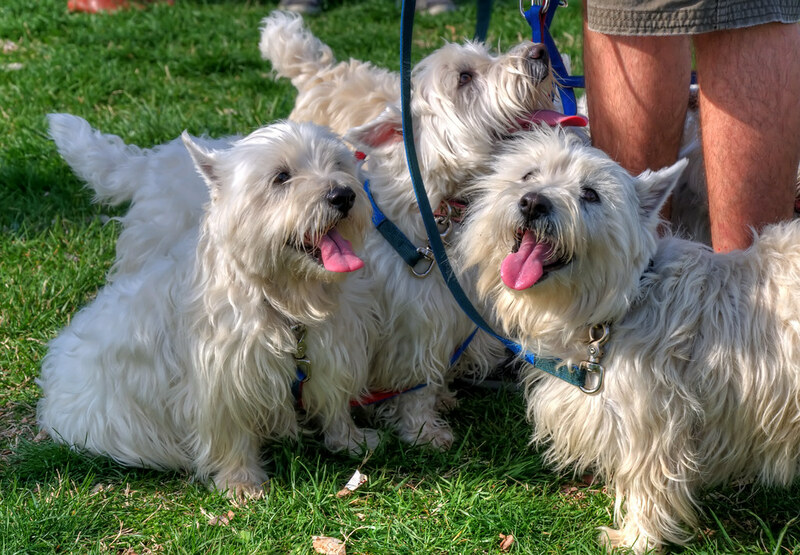 I mean who can resist a bunch of Westies? 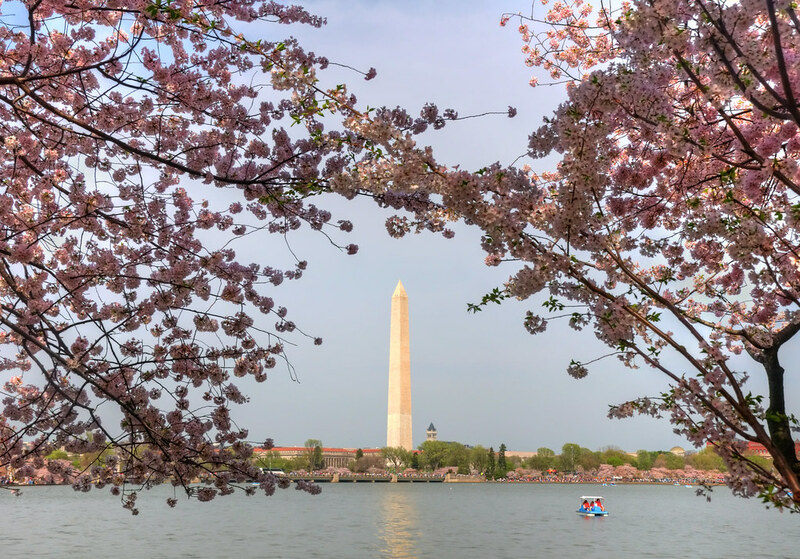 I was really excited about shooting the cherry blossoms this weekend and packed all my gear for a walk down to the Tidal Basin, including my tripod. This turned out to be a huge mistake, as the crowds were so dense that setting it up would have been sheer madness. I spent the entire seven mile trek with it strapped horizontally at waist height under the top flap of my camera bag, all the while worrying that the legs of it were going to hit some rambunctious little kid in the face. Despite the crowds (worst since the inauguration) and mud, it was actually a really beautiful day and I took hundreds of photos. The HDR process really helped this one; in the original photo, the trees were so dark compared to the background that you could barely tell they were pink at all. 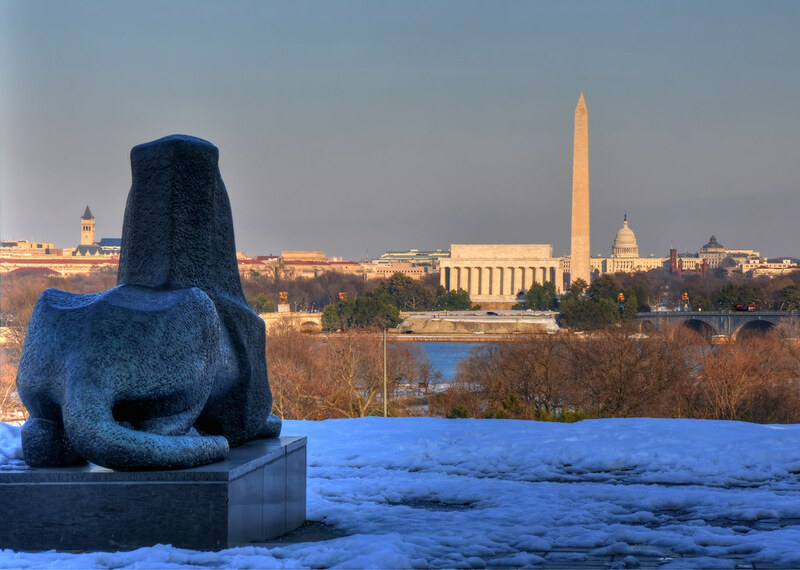 At the bottom of the Netherlands Carillon near the Iwo Jima memorial there are two large bronze lions. They have a fantastic view of the city, and since this shot of the monuments lined up is one of the most classic and oft-repeated photos of DC I thought that having one of them in the foreground would make the perspective more unique. Plus, the texture on the bronze is great and the cold looking snow contrasts nicely with the warm light hitting the city. On a technical note, in order to make the monuments in the background a meaningful size in relation to the statue I had to make use of what’s referred to as the “distance compression effect.” This basically means I stood back from the scene and zoomed in with my lens; I was actually around 20-30 feet behind the statue when I took this shot and was shooting through the bottom of the Carillon.